On March 1, President Trump announced 25% tariffs on imported steel and 10% tariffs on imported aluminum. Earlier that day, the London gold fix was $1,307.75, gold’s low point for 2018. Even though the President later announced exceptions for some allies, tariffs tend to raise the cost of both imported and domestic products and they tend to instigate reprisals by our trade partners. A round of competing tariffs could lead to a trade war, which has historically been bad for the global economy but good for gold. The Dubai Gold & Commodities Exchange (DGCX) has announced that it will launch the first-ever Shariah compliant spot gold contract on March 29. This could open a vast new market for gold among those who follow the strict rules regarding personal finances in Muslim-controlled nations, mostly in the Middle East. Some recently revised interpretation of the Shariah law permits Muslim investors to purchase gold when it meets specific criteria, which will be fulfilled in this new Dubai gold contract. There is a sense of excitement whenever sunken treasure is discovered. In March 1992, Life Magazine called the SS Central America “The Greatest Treasure Ever Found.” Back in September of 1857, major New York banks, business and individuals were eagerly awaiting the arrival of the SS Central America with a large shipment of California Gold Rush bullion, ingots, nuggets, gold dust and San Francisco Mint gold coins. This is the gripping story of the ill-fated sailing in 1857, beginning with one ship’s journey from San Francisco to the isthmus of Panama. Then the gold was unloaded and transported over a 30-mile jungle railroad route to the Atlantic side, to be reloaded into the SS Central America – a 280-foot side-wheeler that had made the Panama to New York run many times. This time, though, the crew had to fight a Category 2 hurricane for three days before abandoning ship. While most women and children were saved, 425 of the 578 on board died. The captain of the SS Central America, former Naval officer William Lewis Herndon, is remembered as a great leader and hero, going down with the ship. It is hard to describe the feeling of seeing this gold for the first time. When treasure hunters first spotted this gold with their long-distance cameras sitting in a mound of glistening gold over a mile below the ocean’s surface, they called it a “Garden of Gold.” Some initial gold was recovered and quickly sold in 2000, but many of us were wondering if we would ever lay eyes on more of this treasure again. Now, finally, more of the ship’s treasure was recovered in 2014 and is available to the public from us. This includes some of the gold coins, gold dust and silver coins recovered. As the famous actor James Earl Jones says, owning money is like “holding history in your hands.” Holding 1850s gold from the California Gold Rush and America’s most famous sunken treasure is like holding a little time capsule of America’s numismatic history in your hands. 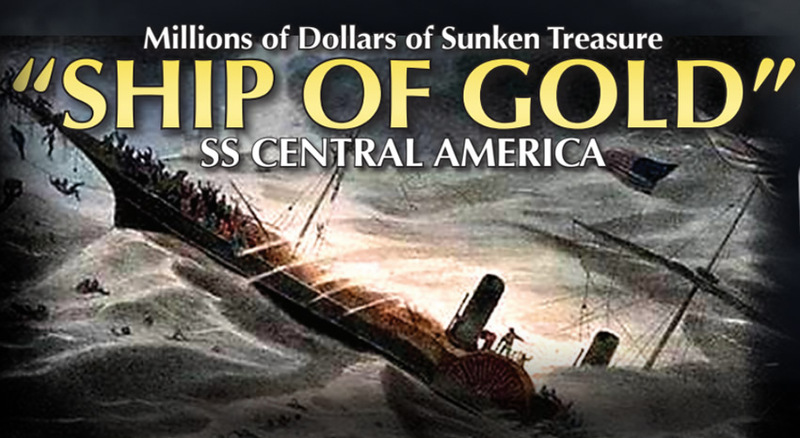 This time, you and your family can be a part of that history by calling to rescue your piece of the SS Central America treasure before it is quickly gone again.